Lp released in 1969. 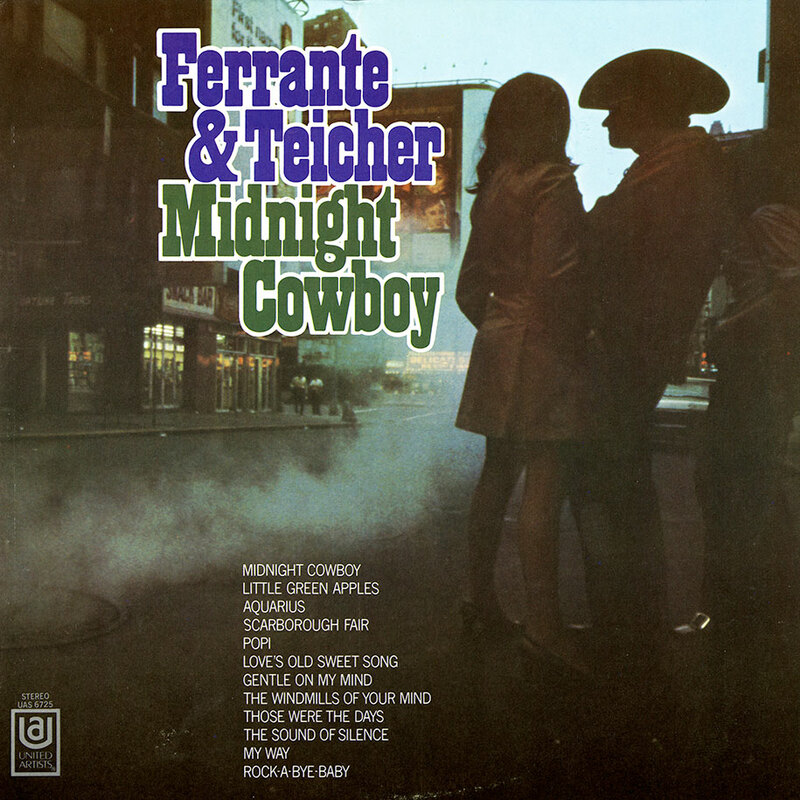 "Midnight Cowboy" was subsequently reissued on Ferrante & Teicher Play The Hit Themes. Ferrante & Teicher have painted a moving, rhythmic picture of our time. They have skillfully incorporated the use of strings, voices, and their famed pianos into a package of free-flowing artistry, enhancing many of the giant compositions of our day. The symbolism of the Academy Award winning "The Windmills Of Your Mind"
The tender, domestice love and tranquility of "Little Green Apples"
The optimistic, and in many ways intesnely moral "Acquarius"
The rock-bottom quest for identiy and haunting melody of the title song, "Midnight Cowboy"
The sadness of times and people lost forever—"Those Were The Days"
The almost poetic eloquence of "Scarborough Fair" and "Sounds of Silence"
"Popi"—an improbable man with an impossible dream come to him. The introspection and sensitivty of "My Way"
It's all here—Ferrante & Teicher and the music that is so much a part of them and of us. "Rock-A-Bye-Baby" was cut from the 1980 Liberty reissue of this Lp.